Stir fry this and stir fry that… You can basically stir fry anything! This is a great combo (Green Beans, Carrots and Tempeh) for a meat-less option that will still keep ya full past dessert. The unassuming fermented soybeans (tempeh) wear a meaty disguise to this veggie party with an amazing ability to soak up the dark soy sauce flavors. Add a pile of fresh crunchy green beans, a few carrots, with plenty of garlic and ginger for a bright and satisfyingly hearty ethnic taste. Speaking of left overs, this is one of our staples for a pre-cooked, packaged meal and frozen meal. We have embarked on many stir fry cooking sprees of over 20 pounds on a Sunday afternoon. Then we split up the loot into 1 pound FoodSaver vacuum sealed bags, the perfect single serve healthy lunch or dinner for a guy on the go. Reheating is a breeze and the flavors / textures remain pretty darn good even after a few weeks! As of this writing, I have eaten our packaged stir fry in 15 states and at 35,000 feet somewhere over Russia… Have stir fry, will travel. In a small mixing bowl, whisk together 1/2 cup water with dark soy sauce, orange juice, sugar, black pepper and corn starch. Set aside. Open tempeh and cut to 1/2 inch strips. Set aside. Rinse green beans, trim ends and cut in half. Peel carrots and chop to 1/2 inch chunks. Steam the green beans for 3 minutes or until slightly soft. Undercook them slightly because they will get a little softer in the stir fry. Steam the carrots for 4-5 minutes or until soft. I usually cook these a little more than the beans so they are not too chewy in the finished stir fry. Set large skillet over medium heat. Add oil and allow to warm until a drop of water sizzles. Add grated ginger and cook for 2-3 minutes until slightly brown. Stir frequently with a metal or wooden spoon. Add pressed garlic and cook until garlic is slightly brown. Add soy sauce mixture and tempeh strips to skillet. Spread out tempeh into a single layer in the sauce. Cook for 5 minutes, flipping once or twice. The sauce will begin to thicken. Try not to over handle the tempeh because it can break apart. The orange juice helps to cut the bitterness of tempeh. Add beans and carrots and stir gently to combine. If the sauce is too thick, add 1-2 tablespoons of water to thin. Cook until beans are tender, about 2-3 minutes. 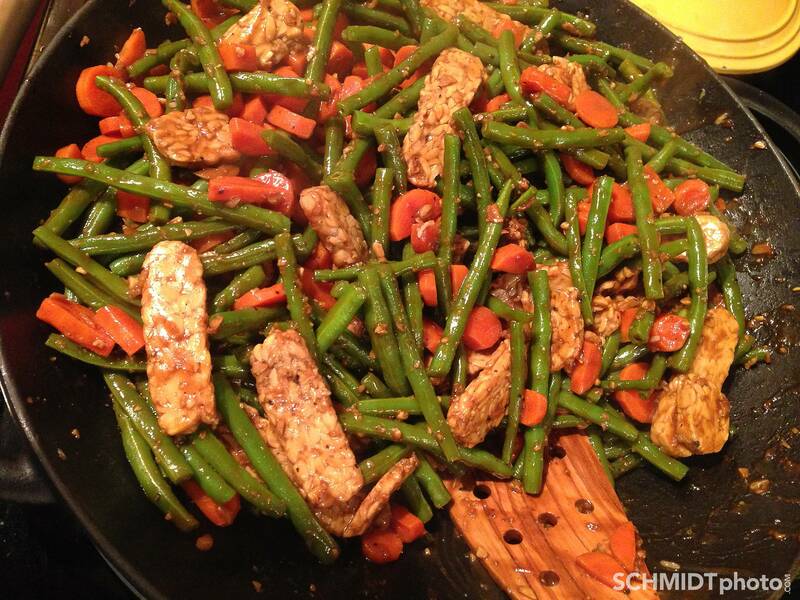 Green Beans Stir Fry with Tempeh - Vegan Dinner! This is a great combo (Green Beans, Carrots and Tempeh) for a meat-less option that will still keep ya full past dessert. In a small mixing bowl, whisk together ½ cup water with dark soy sauce, orange juice, sugar, black pepper and corn starch. Set aside. Open tempeh and cut to ½ inch strips. Set aside. Rinse green beans, trim ends and cut in half. Peel carrots and chop to ½ inch chunks. Add soy sauce mixture and tempeh strips to skillet. Spread out tempeh into a single layer in the sauce. Cook for 5 minutes, flipping once or twice. The sauce will begin to thicken. Try not to over handle the tempeh because it can break apart.